Men tend to be more single-minded when it comes to professional success. Indeed, men develop their self-concept around their profession. Ask a woman to describe who she is and you will get a myriad of roles and relationships. A man will tell you what he does for a living. There’s a reason for this. Men are valued mainly, or at least disproportionately compared to women, for their ability to earn money. Being a stay-at-home wife is perfectly acceptable, but stay-at-home husbands are assumed to be fathers who are married to very successful women. No such assumptions are made about stay-at-home wives. In other words, men who stay at home look after the kids because their wives “wear the pants” in the family and bring home some serious bacon, whereas women who stay at home do so because they can. Now we could just flip things around and say that the “burden” of breadwinning is self-imposed, that husbands delude themselves into thinking this in order to justify not making an equal contribution to domestic labor. Moreover, bringing home the bacon gives the husband a source of power over his wife. Money talks, and nobody walks - she can't afford to. Perhaps women, and society in general, do not value men solely for their ability to generate income, and that a man with a more “balanced” set of priorities might actually be more attractive to women. There’s some truth to this counterargument, but cultural anecdotes and academic research suggest that the burden of breadwinning is very real for men. In the movie Parenthood, Steve Martin angrily protests “Women have choices and men have responsibilities.” Like all good art, there's a sizeable nugget of truth here. Men see women as having more choices, whereas women see themselves as facing constraints that men do not. Women see men as having career opportunities, whereas men see themselves as having greater responsibilities and being forced into narrowly defined roles in order to fulfill those responsibilities. Now I’ll be the first to admit that Hollywood is hardly a font of profundity, but art has to imitate life to some extent. In Frank Capra’s classic movie It’s a Wonderful Life, George Bailey (played by Jimmy Stewart) is about to commit suicide, a fate far more common for men than women, because he doesn’t have enough money to cover a loan and he and his family are about to be put out in the streets by the evil Mr. Potter. George Bailey is going to kill himself because he has failed as the breadwinner of the house. It is only when Clarence, his guardian angel, shows George what his home town of Bedford Falls would be like without him, how his love and caring for family and friends has virtually sustained the entire community, that he discovers, well, that it’s a wonderful life. In the post-industrial world of Bedford Falls, a man’s financial worth is all that matters. His worth as a nurturer can only be established via divine intervention. George Bailey was lucky. Clarence saved him from committing suicide. In Death of a Salesman, Arthur Miller’s protagonist Willy Loman isn’t so fortunate. After more than 30 years, Willy (shown here as depicted by Dustin Hoffman) is fired from his sales job, a position that largely defined who he was. Faced with no job prospects and no way to earn a living, he inevitably settles on the obvious solution. The only way for Willy to regain his self-esteem is to “earn” money via a life insurance policy. Suicide is Willy’s only chance to fulfill his responsibility as a husband and father. Okay. So this is just two movies and a book. Fair enough. But academic research also supports this interpretation. There are far more single mothers than single fathers. Divorce courts have a lot to do with this, but for many decades the largely chauvinistic explanation was that, since men make little or no investment in producing the offspring, they have greater incentive to leave the women (literally) holding the babies, while they go off searching for other female conquests. However, a more careful analysis of sociological data suggests that women initiate single-motherhood not men. Eighty percent of all separations are initiated by women, and they often result from a consideration of the costs and benefits of having a man around the house. The bottom line is that when a man’s income is less than the cost of having him around, he gets the boot. This perhaps explains why “financial problems” is frequently cited by women initiating no fault divorces, and why 70 – 80% of homeless people are men. Once again, art imitates life. In the Ray Charles classic Hit the Road Jack, the woman is very clear about why he has to move out "You ain't got no money!" So perhaps it’s not so surprising that men define themselves in terms of professional roles more than women do. As captured by Nigel Marsh, in his book Fat, Forty, and Fired, a man who does not earn any income has a lot of explaining to do, even to women he hardly even knows. Such is the, usually unacknowledged, burden of being a breadwinner. Single parents deserve a lot of respect. Single fathers deserve special commendation as they take on a counter-cultural role and deliver on their responsibilities to their children in the face of prejudice and discrimination. I hope that single dads everywhere might take inspiration from other single dads who are such heroes for stepping into their parental role - even in the face of adversity. 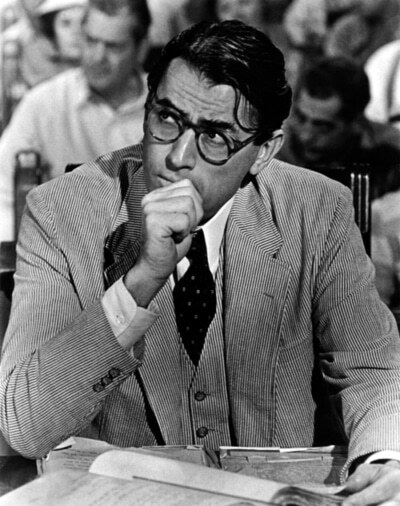 Here's one particularly inspirational single dad : Atticus Finch of the novel To Kill a Mockingbird. His adversaries were not sexists but bigots and small-minded town-folk. We all face challenges. A single father has the potential to earn much respect in the face of adversity he faces. Read more about why Atticus Finch is deserving of respect here.